January 1 is the feast of Mary, Mother of God. This is the most sublime title we can give to this lovely creature who is the finest example of what the human race was meant to be. Because she was chosen to give birth to God come in the flesh, she was preserved from all stain of sin from the first moment of her conception in the womb of St. Anne. This meant that she was free to put all her energy into cooperating with God and thus acquiring more and more grace and virtue. Mary was the Mother of the human Christ, but because He was eternally united with the Second Person of the Blessed Trinity, she is also the Mother of God. 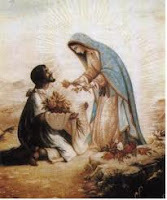 However it is a bit breathtaking to read in Scripture that “anyone who does the will of my Father is my brother, and sister, and mother” (Matt 12:50). We can bring Christ to birth in our souls. But this is not easy. 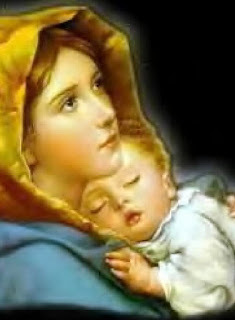 Mary suffered much in carrying to term her baby Jesus. She endured the sarcastic remarks of her villagers who whispered about this child conceived out of wedlock. Even Joseph at first did not understand. 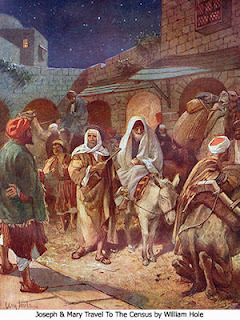 She had to leave the preparations made in her home to travel to Bethlehem at the demand of the government. And this when she was almost nine months pregnant. To ride on a donkey for a week of travel would not be easy even for a woman in tip top physical shape, but for one ready to give birth it must have been incredibly difficult and painful. And it was in the dead of winter. It was cold, rainy, muddy, not much to eat, no comfortable bed to rest in at night. And when they arrived they were refused shelter in the local inn. Her Baby was brought forth in a stable amid the animals. 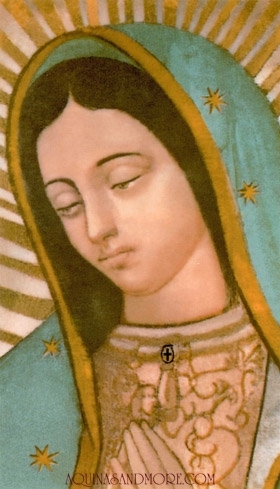 No, it was not easy to be the Mother of Jesus. And it will not be easy for us to bring forth Christ in our lives. But it is worth every minute of discomfort, pain, rejection by those who don’t believe. The joy of knowing the Christ within will wipe away every memory of pain. 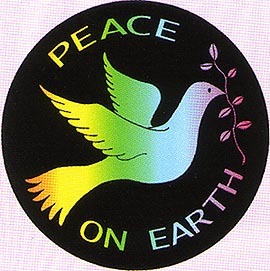 January 1 is also World Day of Peace. Peace in this sad world is something that all of us long for and hope for and pray for. It is a big prayer for a big intention. None of us is able alone to bring about peace on a worldwide scale. But we can each create a little puddle of peace around us. Let us start with those at home - spouse, children, parents, extended family. Then spread to the workplace - coworkers, managers, directors, supervisors. Because we are all human and belong to a fallen race, there are so many opportunities to create a tiny bit of peace. Without becoming door mats, we can overlook little digs, restrain an angry reproof, respond instead of react, let the little things pass and save the ones that must be dealt with for a time when we can speak calmly and respectfully. These little puddles of peace will multiply and spread. Soon there will be real ponds of peace, and hopefully as these ponds grow, there will be lakes and eventually oceans of peace. May peace be with you and around you in the New Year of 2013. Our beautiful Christmas cards, lovely lullaby hymns, and Christmas pageants can sometimes give an inaccurate impression of what really happened. 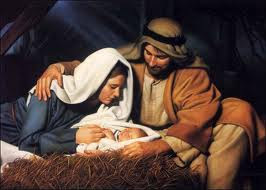 When Jesus came into the world on that first Christmas it was not in a camera-ready Christmas card setting with a clean, neat bed and all the people in their proper places, knowing what to do and when. Think of the reality of the situation. Mary, in the last days of her pregnancy, put aside all her preparations for the coming of her Baby to make the long hard trip to Bethlehem which she believed God wanted of her. Travel is never easy, even in our day. 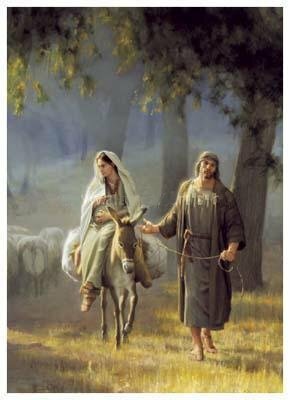 For instance, anyone who has made a long journey by plane is doing it the easy way, compared to the Holy Family and their mode of travel. But we know that there is packing – choosing what you can take and what would exceed the weight limits. A revised estimate of what is absolutely necessary quickly dawns on you. Then there is the rush to meet the plane, the hassles with luggage and tickets, finding the right boarding gate, elbowing your way through the noisy crowds, arguing over seating arrangements, making do with skimpy means en route. Sleep is hard to come by, taken in cat naps on uncomfortable chairs in planes or waiting rooms of airports, trying to hold on to your few worldly possessions lest they be snatched while you doze. The fatigue builds up until you are ready to drop. Everything is unfamiliar, uncertain, unready. Now as we said, that is the easy way. It was far worse for the Holy Family. 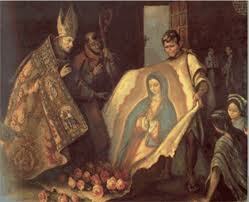 Poor Joseph tried his best to smooth the way for Mary but he was not understood by his countrymen. Mary and Joseph probably heard things like, “What do you mean coming out in this cold weather in your condition? You ought to be home preparing for your child. What kind of father are you? The law does not oblige you to drag your wife along for the census. Are you crazy?” But it was under exactly these conditions that Mary brought Jesus into this world. Yes, it was exhausting, draining, unpleasant, but down deep there was extreme joy. For Mary and Joseph it was all worth it, to bring into this weary world the Savior which mankind had expected for centuries. To hear the story of the poor shepherds who related how the angels had sung in the skies to announce the birth of this little Baby. To be able to use the little strength and resources they had to support the life of the Creator of the World. What glory! What an honor! When we experience fatigue, stress, misunderstandings, complications, pain, we can look to the Jesus, Mary and Joseph who understand all these things from their own experience. They will help us to ‘hang in there’ and look below the surface. There we will appreciate the privilege of being part of this magnificent plan of God. Today the Holy Family can again be seen in our midst. Each time we notice an exhausted mother, a stressed father, a child in need, we can look into their face and rejoice in the honor of serving Jesus in disguise. 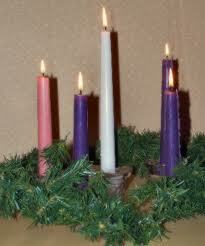 May the holy and blessed season of Christmas bring many graces and joys to each of our families and friends. As we enter deeper into our Advent journey, we begin to understand more fully the exciting reality of the presence of God in our lives. In preparing for the great feast of Christmas we look at our lives to see how we can empty some of the harmful or unnecessary clutter we find there, in order to make room for Christ who wants to fill our souls. By purifying our minds and hearts in this way we also prepare ourselves for the final coming of Christ which will be for each of us, the moment of our death. Meanwhile we notice more and more that He is with us in all the little events of our daily life. Did He, Himself, not say, “I am with you always; yes, to the end of time.”(Mat 28:20) And that means NOW, even at this very moment. He is with us to console us, to strengthen us, to teach us the right way. The feast of the Immaculate Conception on December 8 is one of the great holy days of the Catholic Church in every country. And yet it is very special in our United States of America because Mary, under the title of the Immaculate Conception is the Patroness of our country. 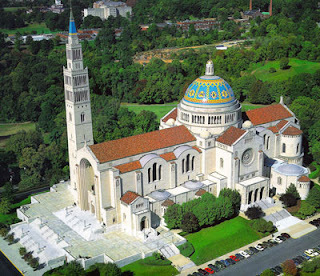 The magnificent National Shrine of the Immaculate Conception in Washington D.C. displays the unity of our Church in America to all who visit there. The beautiful chapels to Our Lady show her as honored by the many different ethnic groups that make up our land. 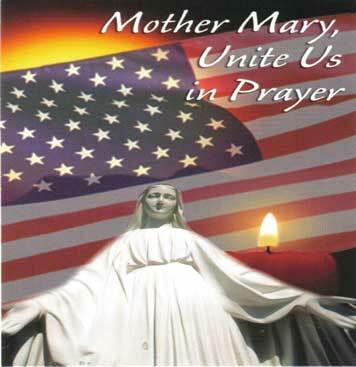 But we all come together to speak our devoted love to one and the same Mother - Mother of God and our Mother. 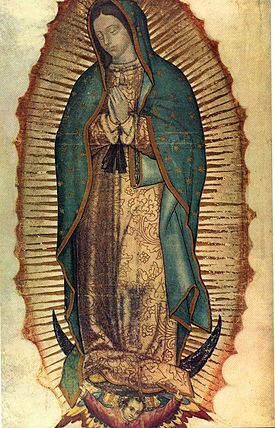 As each wave of immigrants came to America they brought with them the devotion to Mary as it was expressed in their homeland. 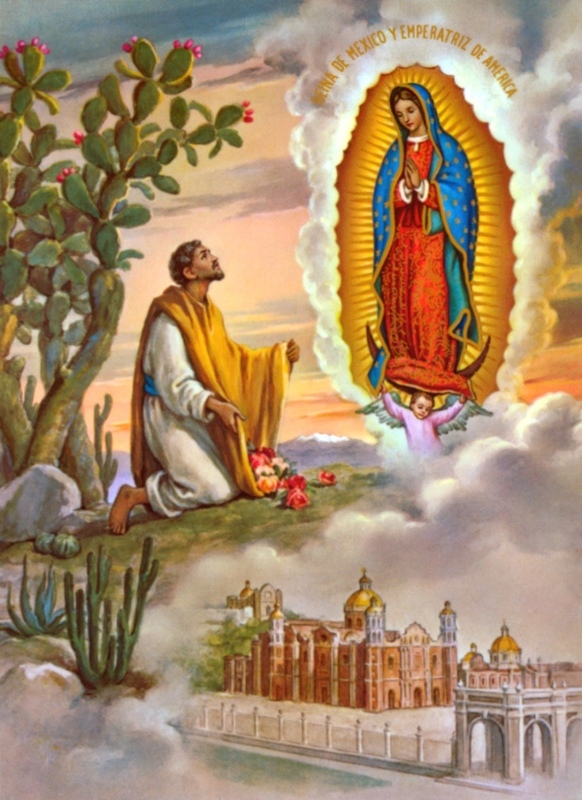 Each enriched the honor of Our Lady by adding a different ‘tone’, and thus we have the grand and glorious hymn in architecture, painting, sculpture, music, prayers, customs, and traditions which make up that Basilica and also devotion to Our Lady in all the churches and homes of the land. We honor Mary under the title of the Immaculate Conception because, as the poet Wordsworth says, she is “our tainted nature’s solitary boast”. 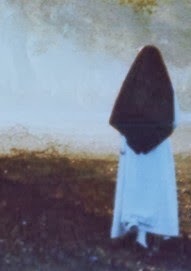 She alone, of all the human race, was conceived and born with absolutely no trace of selfishness, pride, greed, lust, anger, or any of the other dark powers that weigh us down and often block our path on our earthly pilgrimage. She is our model, our protector, our inspiration in the struggles we meet in daily life. 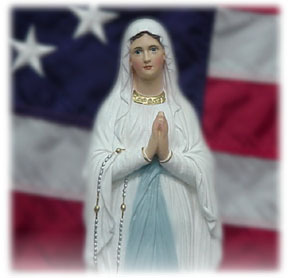 But besides guiding each of us as individuals, she watches over our country as a whole. This is not a political guardianship, but a spiritual one. If we are open to her teaching she will guide us to making the right decisions which will be for the common good and therefore for the individual good too. A holy nation is a happy nation and Mary is willing and able to lead us to that goal if only we ask her help and carry out her instructions.